Things aren’t what they used to be. The world map has changed, and it seems our customers are embracing the new-age look. Sure you can still buy the traditional world maps that were drawn by talented cartographers from a time long ago. 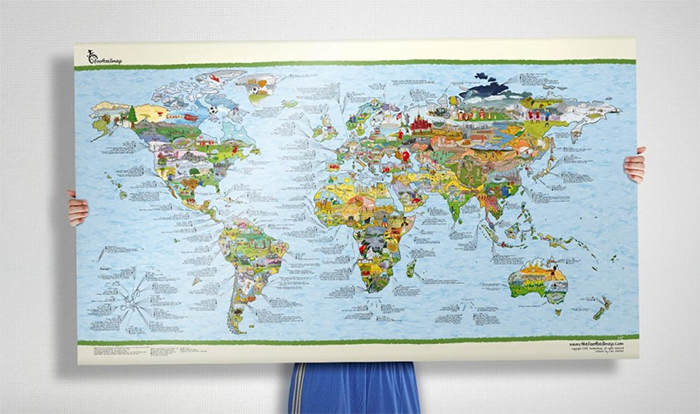 But now you can buy the brightly coloured, illustrated world maps themed with a special interest. 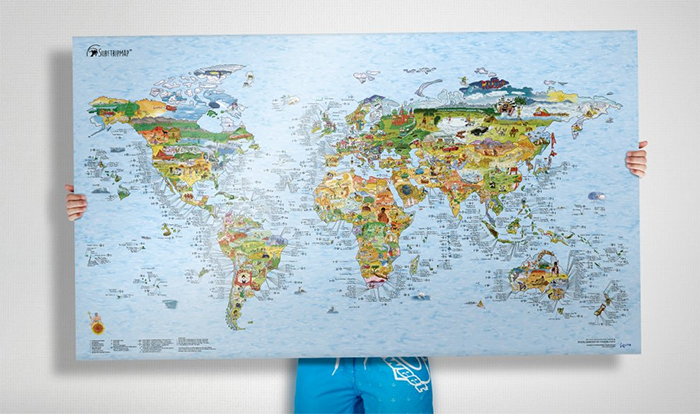 If you’re a surfer, there’s a map for planning an around the world surfing trip. Over 1,000 surfing hot spots are noted on the map with info on each one. Important stuff like shark attack risk and more uplifting stuff like wave quality, water temperature and the best season to enjoy the barrels. 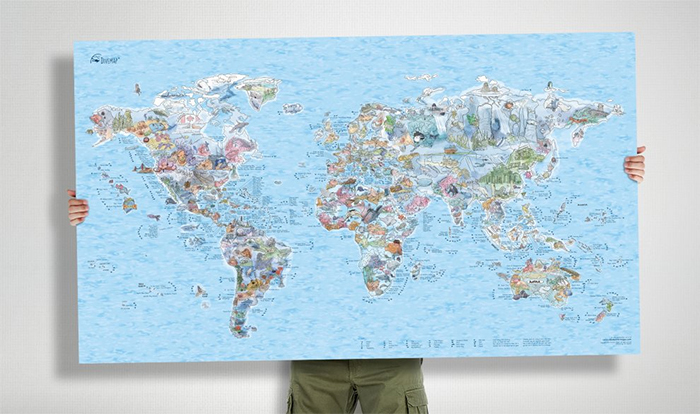 This was the first of the Awesome Maps after the founder couldn’t find a surfing map on the web. The whiteboard coating allows you to make your own notes on the map like white pointer spotted here, find somewhere else for a surf! 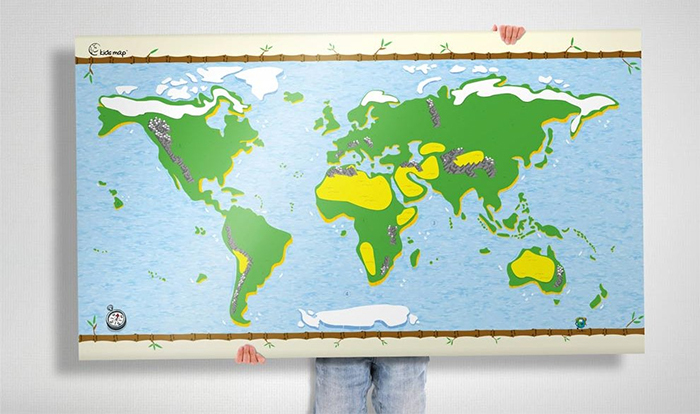 Try as you might, this map won’t put your kids off pursuing their passion so give them one as a gift. If you thought a bucket list was a scrap piece of paper filled with an old guy’s scribblings, think again. 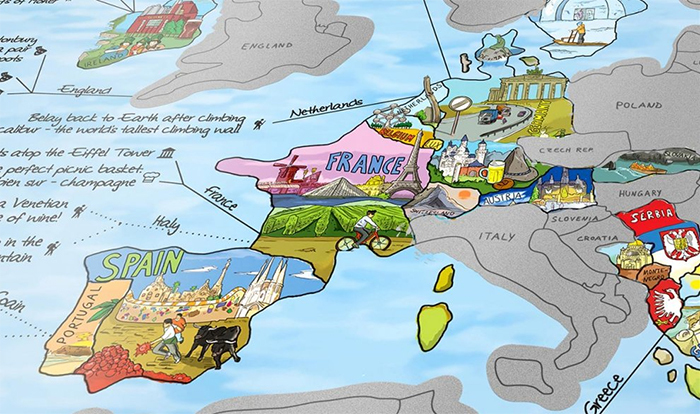 The world bucket list map includes plenty of ideas for traversing the globe ticking off adventures and destinations. There are suggested road trips (clearly the kids are off your hands), adrenaline rush opportunities, man-made things to marvel at and eats and treats (sounds like a good way to go). Map out your personal bucket list with its rewritable whiteboard coating. If you want to include a few dive sites on your bucket list, better pick up a dedicated dive map too. There are over 500 dive spots with info about the type of dive and underwater features. Plan your dive trips then tick them off – been there done that one. 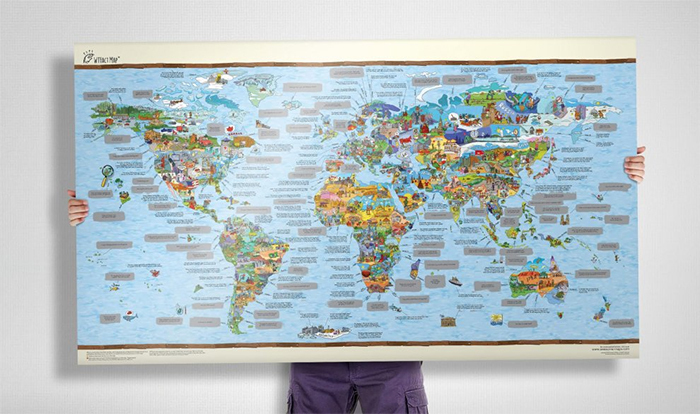 Kind of like a giant scratchie, this map allows you to scratch the silver layer off to reveal the country you visited. But if you can’t wait, walk on the wild side and scratch the whole lot of at once! Of course, adults can’t have all the fun. 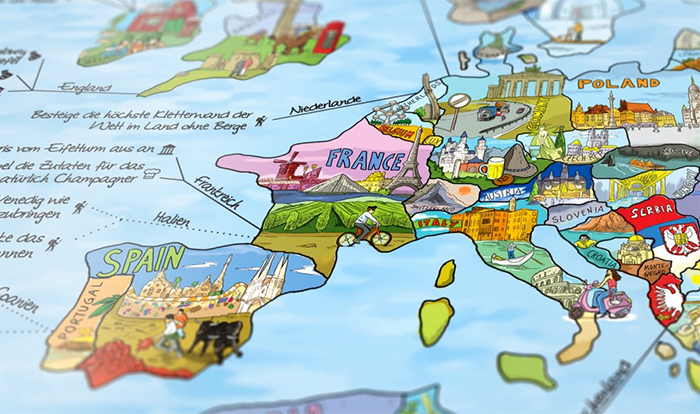 The kids are taken care of with a map, illustrated with stickers and flash cards. They can learn about the world of animals, places and culture and play geography games one-on-one or in a group. Just don’t tell them it’s educational. If they get a little carried away with the whiteboard pen, just wipe it off the whiteboard coating. Even football deserves an awesome map. If you have a football mad person in your life, buy them a map that shows facts about national teams, top scorers and fun facts around the world. Nothing says international sport more than an Awesome Football Map. Just when you thought WTF meant something completely different, the WTFact Map will give you wacky facts about almost every country in the world. Try to guess the fact based on the hint and illustration then scratch off the silver coating to see if you are a winner. So there you have it, there’s an Awesome Map for everyone. They’ve nailed the design with each map illustrated by a different artist so they all have their own unique flavour. 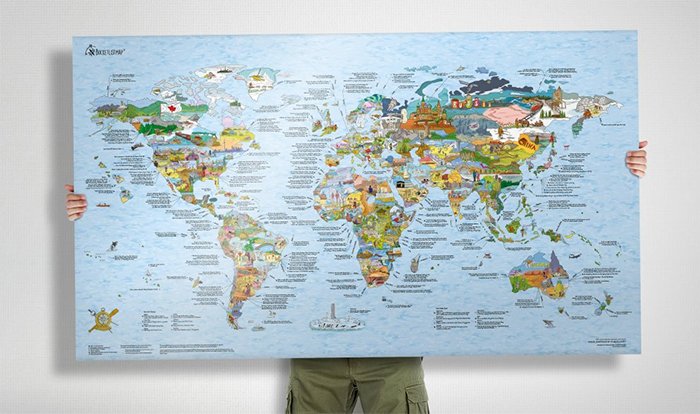 Awesome Maps make ah-mazing gifts or just buy one to enjoy some awesomeness on your wall at home. Large Scale vs. Small Scale Maps – What?